Teaching some of the younger guys the ways of the Bowie. It was amazing how well they did with a little bit of class learnin' and a lot of sparrin' with the wooden trainers, but then again these wern't normal "young people of today!" 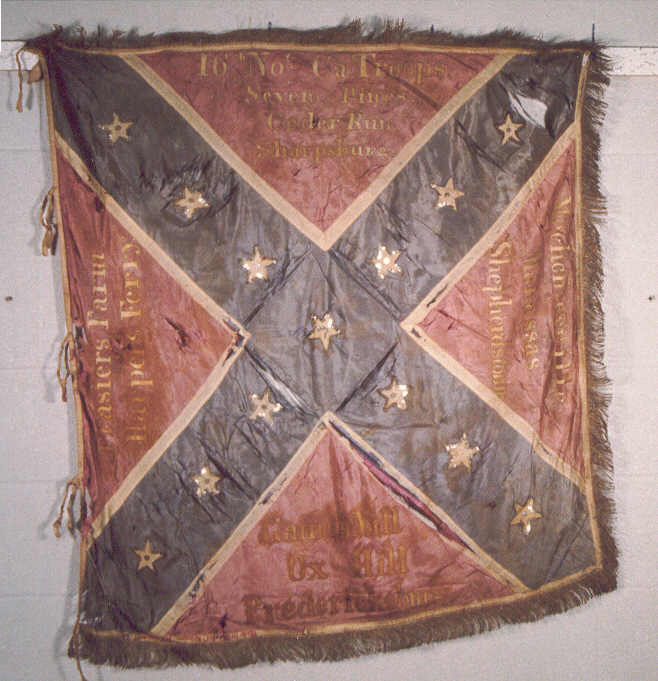 They were a soup pot packed with red hot snappin' turtles, all chock fulla' fight an' used to doin' drill, firin' rifles, and beatin' Yankees! 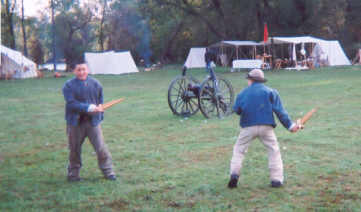 They sent more than one grown man from the field a'knowing he'd been bested (and had his knuckles busted up to boot). 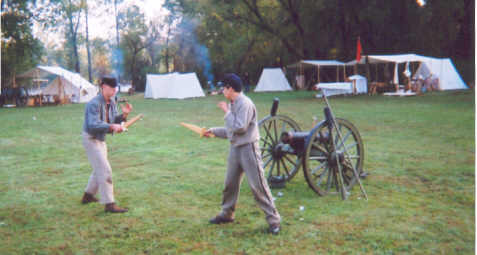 Sparring by a cannon actually used in the Civil War, and still fired today at reenactments. 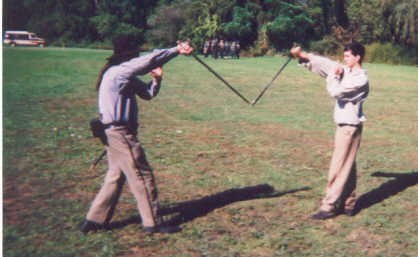 Double Knife Drill - Here I am coaching Tod in a double knife exercise. 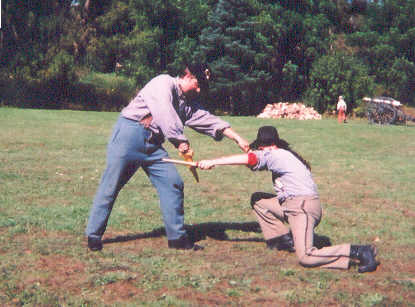 I am stabbing him with both hooking and linear stabs, striking both high and low, while alternating which knife I'm attacking with. He is parrying each attack with the same side knife while simultaneously delivering a stab with the other one. This way he uses only four basic techniques and can beat any attack. 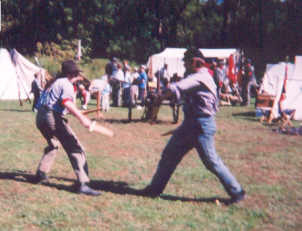 Drilling with Jacob on the saber basics and set-plays with live steel, before doing some sparring with single-sticks. 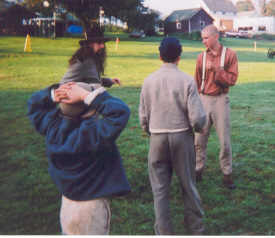 I conducted drill for some of the unit on General George McLellan's bayonet exercises. 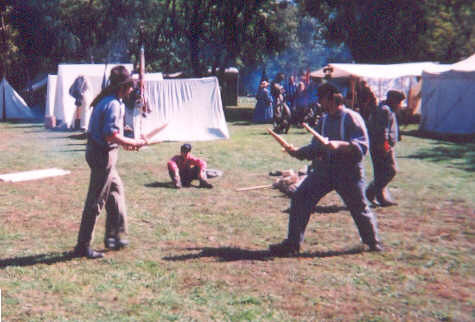 We used muskets with the spike bayonets, which I prefer in some ways over the sword style, and the weapon's weight made performing such movements as "Lunge-Out" (where the weapon is thrust one handed) very difficult for people (let alone that that they were drilling in the sun, in front of a crowd of spectators). I focused the instruction on the material from chapters 5 and 6 of McLellans manual, combining basic steps, parries, and attacks into 3-step sequences; such as "Parry Seconde, Lunge with Development, Guard"